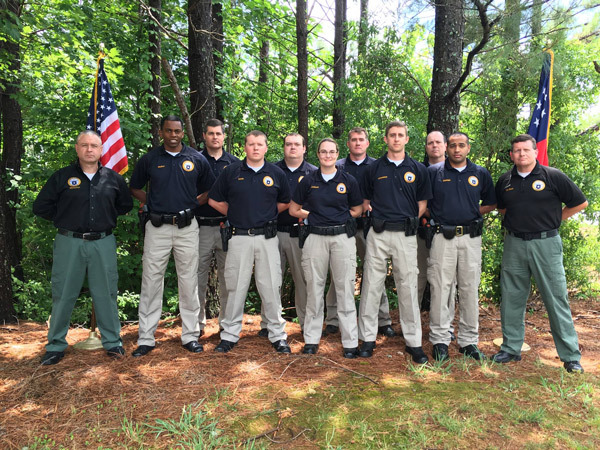 Ten students now are certified police officers after graduating from Reinhardt University’s Police Academy late last month. Director Trey Drawdy said the graduation for Class 16-001 was held May 27 at the Falany Performing Arts Center, and there already are 45 applications for Class 16-002 to begin this fall. Graduates of the first Police Academy Class of 2016 are: Matthew Walker, of Duluth; Brandyn Smith, of Adairsville; Devon Holobach, of Woodstock; Leon Lancaster, of Alpharetta; Mushtaba Siddiqui, of Duluth; Joel Smith, of Kennesaw; Marcus Lamb, of Waleska; Gary Elliott, of Buford; Scott Nielsen, of Johns Creek; and Jose Marrero, of Gainesville. Ten people recently graduated from the Police Academy including front row, from left, Matthew Walker, Brandyn Smith, Devon Holobach, Leon Lancaster and Mushtaba Siddiqui; and back row, from left: Joel Smith, Marcus Lamb, Gary Elliott and Scott Nielsen. Jose Marrero is not pictured. Several leave the academy with employment opportunities, including Lancaster, Smith and Elliott who were sworn in as police officers for the Alpharetta Department of Public Safety during graduation exercises. Other graduates are now employed with the Gwinnett County Sheriff’s Office and the Winder Police Department. The Police Academy at Reinhardt University is certified by the Georgia Peace Officer Standards and Training Council (POST) and meets at the North Fulton Center in Alpharetta. The Academy boasts a 96 percent employment rate based on 2015 graduates. In 2014, 89 percent of its graduates had employment secured by graduation. Drawdy said the program is structured in a non-traditional format, allowing those with full-time jobs and/or family responsibilities to complete their education. Most students in the program are pursuing an Associate of Science in Criminal Justice. Those who choose to pursue a four-year degree are appropriately guided to one of Reinhardt’s advantage degree completion programs. Because the program is tied to academic programming, qualified individuals may utilize financial aid to assist with tuition costs. Applications are being accepted for Spring 2017. For more information, click here.